New Ken/Arnold Social in the Park 's 4th Band Blast Concert. This is our 8th annual Social in the Park event. 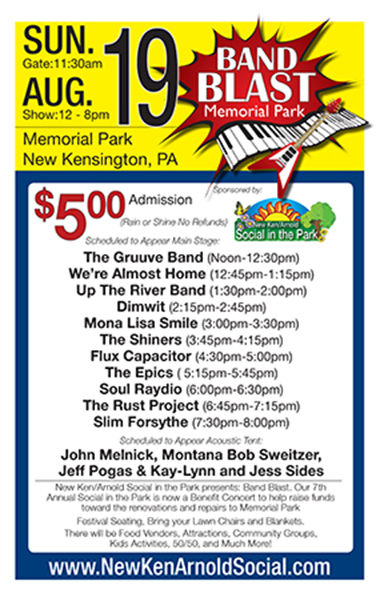 This Benefit Concert is to help raise funds towards the renovations and repairs of Memorial Park. There will be 11 acts scheduled to appear on the Main Stage and 4 bands at the Accoustic Stage, food vendors, Kids Activities, Attractions, Much More!!!!! We are also accepting donations. Created 2014 All rights reserved.